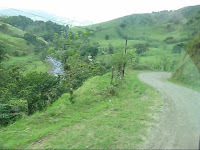 I booked our Costa Rica tour using G Adventures' independent tour services. One of my requirements were hotels close to town and, if the hotel did not have an elevator, a first floor room. In that respect, G Adventures came through ... Hotel Poco a Poco met the requirements. G Adventures presented me with a list of hotels for me to review and accept or reject. I accepted this one because of the location. In retrospect, I should have paid closer attention to the reviews on tripadvisor. Since it was right on the road, we heard the traffic which did stop at dark but resumed early at first light. The hotel had wifi but no terminals for guests to us. If I wanted, I could have rented a laptop for $3 per 1/2 hour or $5 per hour. I guess they expect everyone to travel with their laptop or iPad. We don't. The room was good sized but no place to really hang clothing. The TV stood on a wide chest high cabinet that had hanging space at one end ... not really high enough for shirts or pants. The bedspread was stained and the bed sheet had a worn spot that I probably could have put my finger through. On the positive side, across the street and a little bit up the hill was a "mall" with a supermarket. By crossing through the mall, we came to another street that gave us a relatively easy walk into Santa Elena. (I say 'relatively' because there are only two ways to walk in this area: up or down.) 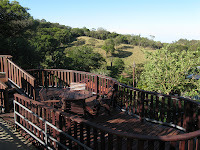 There was also a spectacular view from the deck area leading down to the pool. The pool was shaded and I had it all to myself one afternoon, allowing me to sit back on one of the steps to read. 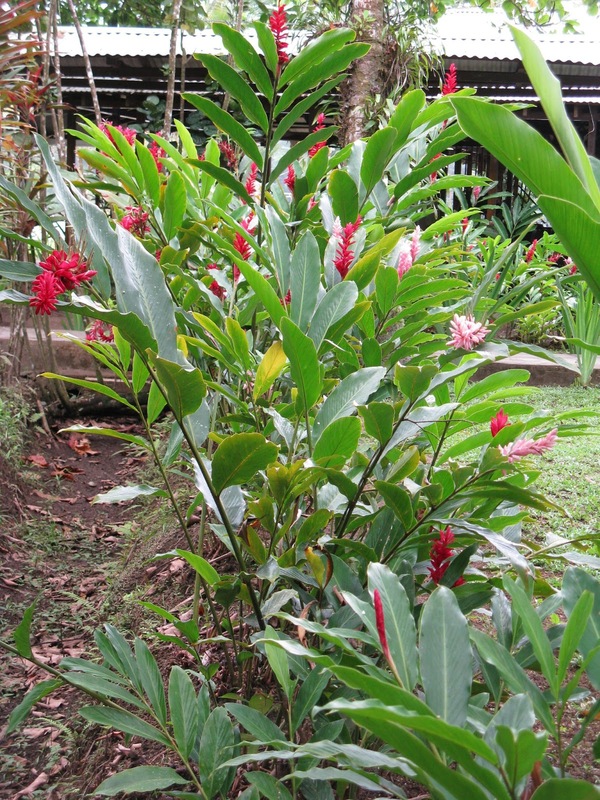 The trip from La Fortuna to Monteverde is an experience in and of itself. First there is a mini-van ride. Then there is a boat ride. Then there is another mini-van ride. 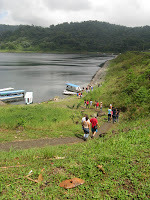 The first mini-van ride was over paved roads with a fog-shrouded volcano, Arenal, off to our left. As has been typical on the days of our transfers, it was raining on and off. 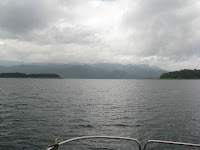 We were dropped off cliffside, overlooking the boats waiting to take us across the lake. Fortunately we didn't have to carry our own luggage down ... we just had to get ourselves down to the boat. The ride across was pretty smooth, in spite of the threatening clouds and low fog. 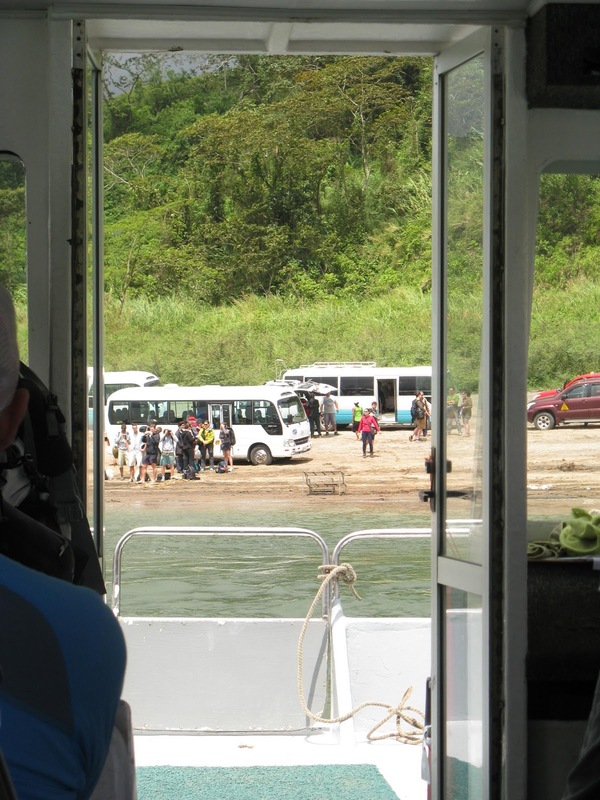 On the other side, the vehicles waiting to transport us to Monteverde were right at shore side.We were suppose to go into bus 2. But bus 2 never showed up. There were 6 of us and, finally, the decision was made to split us up into the three remaining buses. So, after a bit of a delay, we were on our way. 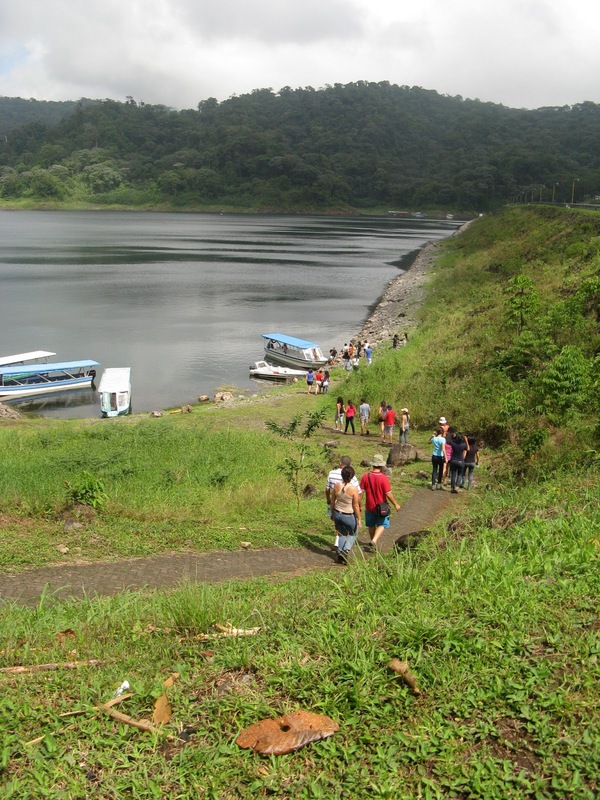 Travelers have an option on how to get from Lake Arenal to Monteverde. You can either take a van, as we were doing, or go by horseback. The time I was in Costa Rica with Lynn we went horseback. Let me tell you that three hours on horseback was an easier ride than our van ride up steep hills, down steep hills, around sharp curves, steep dropoffs on one side or the other .... all on a dirt road until we got close to Santa Elena ... the small town that is the center of commerce for the Monteverde Cloud Forest Preserve area. 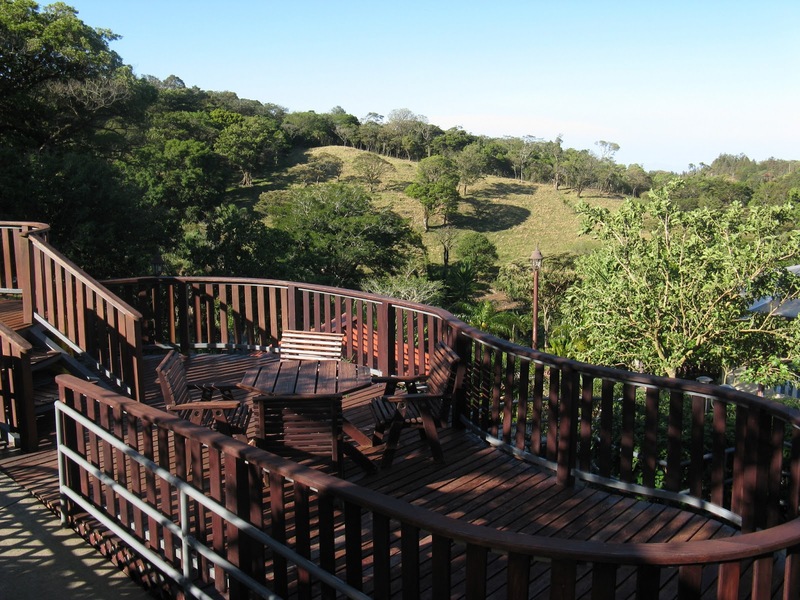 I would not hesitate to recommend Manatus Lodge. Our pickups and transfers ran smoothly. All meals are included and the food was excellent, served by helpful and friendly staff. Unlike the rest of the hotels we stayed at in Costa Rica, breakfast here was not a buffet but instead ordered off a menu. A menu was also provided for lunch and dinner. There are 12 rooms, each their own 'separate' bungalow (although at first it didn't looks that way because they were four in a cluster with a corner attached). 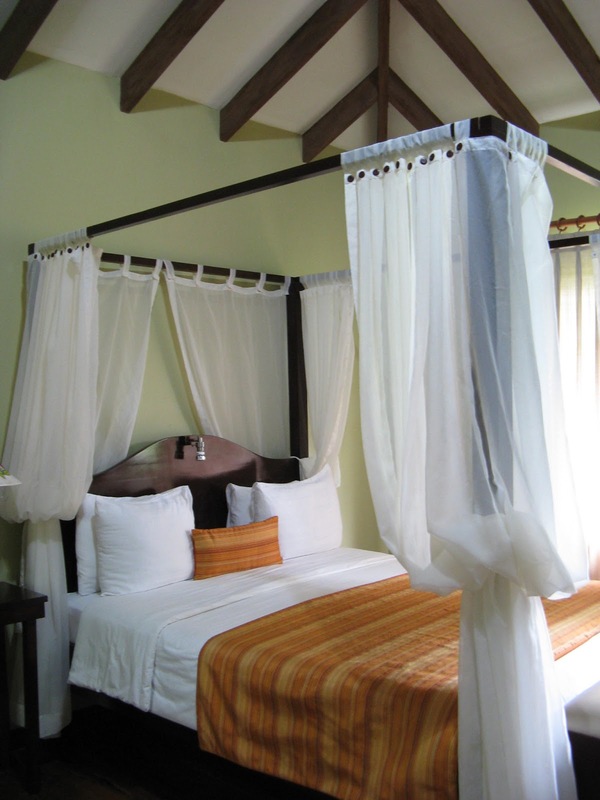 Our room had two four poster canopied beds which were very comfortable. The air conditioning worked well and we were grateful that we had it. The bathroom had a huge walk in shower and I was really delighted with the bathroom sink bowl ... obviously so delighted that I had to take a picture. 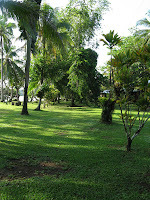 The grounds were lovely, with groundskeepers working hard to keep it neat and clean. 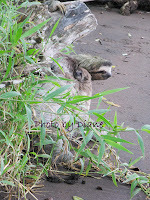 We were also very lucky here with the wildlife. The first morning another guest directed us to one of the trees along the water's edge (far left background in this picture) where there was a female sloth with a baby on her chest and, on another branch of the same tree, a huge iguana. 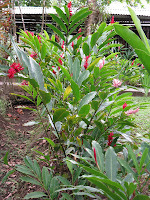 There were beautiful flowers bordering the walking paths. See the roof along one of the walkways at the top of the picture? My husband was up and out early that first morning to try to get pictures of the howler monkeys in the trees that were just at the edge of the property ... and found some scampering along the walkway rooftop! Overall the stay was very pleasant. I had originally planned on three nights here but the agent at the tour operator we used (G Adventures ) said two nights were really enough. She was right. 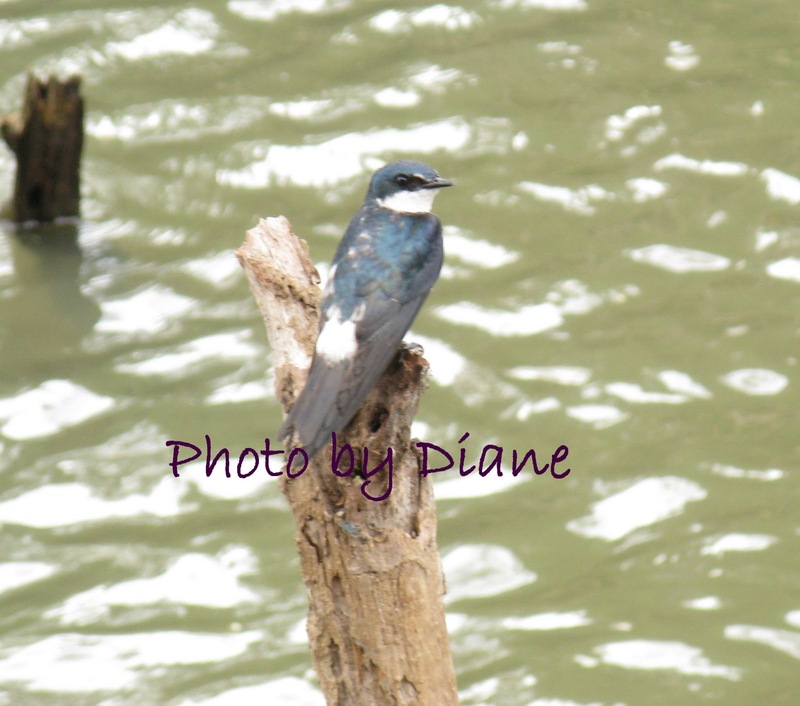 We felt like we could stay for days with all the wildlife we saw on the property on our first morning but, as we discovered on the second morning, that doesn't always happen. Our packet of instructions said 6:35 a.m. pickup for our transfer to Torteguero. Arriving just a few minutes late, we were apparently the last pickup. With six of us in an 18-passenger van, we headed out of the city. Oncoming car lights can barely be seen. 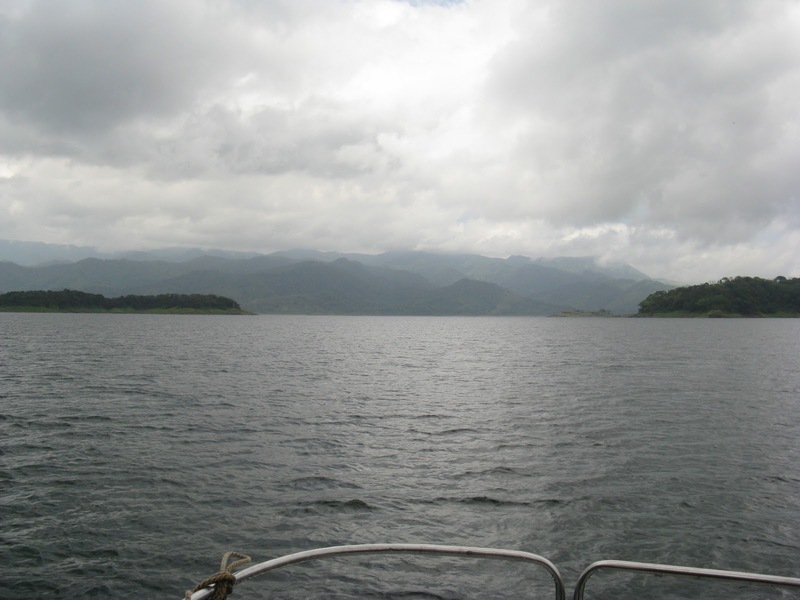 Our route took us east through Barillo Carillo National Park. This is a beautiful rain forest and, on this particular day, it certainly lived up to its name. We hit rain and fog along with lots of traffic. Up hills and down hills. I'm sure glad I wasn't driving. About 8:30 we stopped in Guapiles at Rancho Robertos for a buffet breakfast. Then back on the road, for about another hour, to the "port." Along the way we stopped for some nature lessons, including information on bananas and pineapple. Didn't know that Costa Rica was the largest grower of pineapple and the pineapple we had at breakfast every morning was fantastic. Finally, the "port," a large parking area along the river, with one building that housed a small grocery store, bar and restaurant. Lined up along the shore line were boats going to the various Tortuguero lodges. 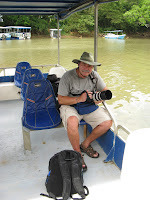 Our luggage was loaded onto our boat, we were handed off from our land guide to our river guide, and off we went. 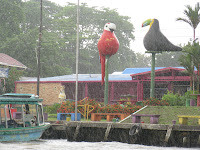 The main pier in Tortuguero. While the main goal now was simply to get us to the lodge, if the guide spotted something special he pointed it out ... such as a male and female Great Currasow, an endangered species not spotted very often. 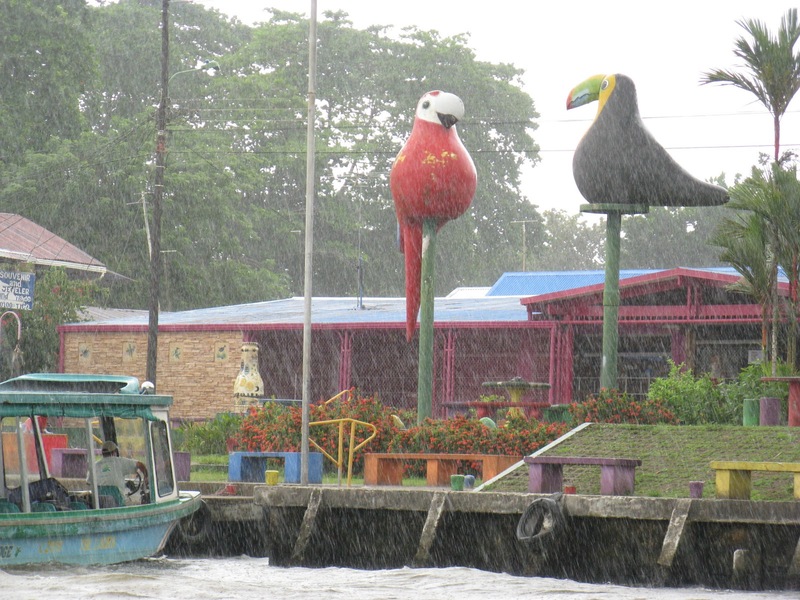 After about a 45-minute ride, we passed the town of Tortuguero just as the skies opened up. 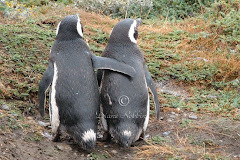 But it didn't last long and we made it to our lodge and accommodations without getting drenched. 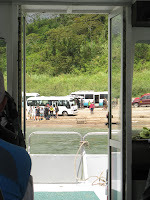 After a delicious lunch in the open air dining room, we were taken by boat into Tortuguero. I visited this village in 2007 and what a change in those six years. It is larger and with a lot more souvenir shops. It is also busier. Miss Junie's, where I stayed last time, has had a badly needed face lift. We had a free 1 1/2 hours here and it was plenty of time. We walked over to the Caribbean, which was very rough and where I managed to get my sneakers soaked. (Fortunately we had air conditioned accommodations and they eventually dried.) We had some fun with a young couple we met, Adina and Liviv, who are from Romania. Liviv spoke minimal English and yet he and Jerry managed to get on just fine, with Liviv doing his best to help Jerry in and out of boats and to spot wildlife for Jerry to photograph. We stayed at our lodge for two nights. 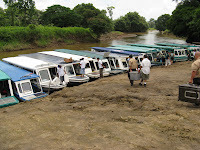 The stay included two boat excursions into Tortuguero National Park. Unfortunately, those excursions were disappointing. 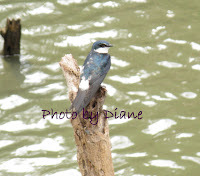 While we did see wildlife, the most exciting wildlife we saw was in the morning at the lodge. Jerry was up early and there were howler monkeys all over the trees ... plus running along the roof over the walkway. And both of us got to see a sloth -- with a baby -- come down from her tree for her once-per-week poop time. Many, many more airports need to do this. The airport has begun to install departure information boards in Terminals 1 and 2 that show the average walking times to various gates. As the flight is assigned to a gate, the board will display the amount of time it would take an average person to walk to that gate from the sign's location. Eaight boards are being installed behind the security screen areas and passport check area in Terminal 1 (2 in Pier A and the rest in the non-Schengen part of Pier B). There will be a new board in the Schengen part of Terminal 2. For travelers with mobility problems, is their gate is in the new C/D pier between terminals 1 and 2, they may take advantage of a free shuttle that runs regularly through the corridor. The airport has also set up a "fast lane" at security. If your flight is departing in less than 30 minutes (just check the screen at the check point) you may use the fast lane. Traveler treatment like this would have been most welcome to me and my husband during our recent dash through EWR from our international flight to our domestic flight. Due to Costa Rica being two time zones earlier, we were, of course, up early. We hit the breakfast buffet shortly after it opened (6 a.m.) and had a leisurely breakfast since we know nothing would be open yet in the city. We finally struck out around 8:15 a.m. and wandered around the little park across from the hotel. We then made our way to the Mercado Central (Central Market). Maybe it was because it was still early but the market wasn't anywhere near as busy as I remember it being when I visited with Lynn. Anyway, we strolled through and then went to the Museos del Banco Central de Costa Rica, commonly known as the Gold Museum. We arrived before it opened so found a place to relax in the plaza that sits above the museum and people and police watched. Museum opened at 9:15 and we were the first ones in. Tickets are 5,500 colones which translates to about $11 per person. We spend about two hours in the museum. Jerry enjoyed it as much as I had previously and we both enjoyed the displays and found the information on the signage very interesting. For lunch we found a place serving pollo asada (roasted chicken) and then continued to do some wandering about the downtown area, including J stopping into a shop to purchase a couple of Costa Rican music CDs (which, unfortunately, turned out to be disappointing). I was then able to find the same ice cream shop (POPS) where Lynn and I had ice cream during our visit. After purchasing a chocolate brownie ice cream cone, we made our way back to the hotel to rest. As we approached the hotel we passed a small market and I purchased a BIG bottle of water for $3 ... much better than the $2 small bottle at the hotel. We used bigger bottles, throughout our trip, to keep filled the smaller bottles that we carried with us. We wandered a bit in the evening to find a place for dinner. Decided to give La Criolita a try and we had a very nice meal. But one thing I can definitely tell you ... prices have gone up since my last visit. The cost of restaurant meals is approaching U.S. prices. We were careful and it was still hard to have a restaurant meal for under $10 per person. Our trip was put together by G Adventures and I specifically requested this hotel. I have been to San Jose before and this hotel had the location that suited me. It was within easy walking distance of places that I wanted to re-visit, but this time with my husband. Check-in was a breeze. I asked about bottled water at the reception desk and was told I had to buy it from room service. As there was someone from room service right by the desk, it was easily taken care of for us. And as I expected, this hotel had U.S. prices with a small bottle of water costing about $2. Our room consisted of two double beds and was very roomy and comfortable. The next morning we hit the breakfast buffet which had a lot of varied items from tropical fruit and cold cereal, to gallo pinto (rice and beans), plantains, queso (cheese), jamon (ham) and custom made eggs. Basically the hotel is your standard business class hotel. There were three computers in the business center and Internet access was good. The front desk was manned 24 hours a day and there was always a doorman and bellhop to assist. If you are looking for a place to stay in San Jose that offers a Costa Rican experience, this isn't it. 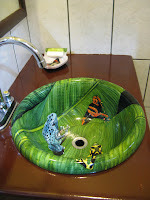 But if you are looking for a hotel that can provide you with typical American standards, this hotel works just fine. Note one important thing: This hotel has a clearly displayed sign that says it does not take travelers' checks ... only cash or credit cards. Based upon my experience, the best option is cash, with credit cards second. There is an ATM at the airport just before leaving the international arrivals area and plenty of ATM availability around San Jose. If you MUST travel with travelers' checks, be prepared to stand on long bank lines, with your passport, to get them cashed. I hate changes in time zones. Our first night, in bed late (for us) after we arrived in San Jose at around 10 pm. and, of course, up early the next morning. No shops were open yet. So I figured I´d take the time to draft my first post, to be scheduled to drop once we get home. Starting at the beginning, it was a good thing we had 2 1/2 hours between flights. Wind sheers in Newark delayed our puddle jumper flight. Then, once we finally left the gate - an hour late - we sat on the runway for another 1/2 hour. Then, just as we were about to land in Newark, the onboard computer waved the pilot off and we went up and around again. Finally, after landing safe and sound, we had to wait for our gate checked luggage. We always distinquish our luggage by using neon green straps . Good thing. After we left the jetway with our bags, J discovered his gate check tag was not on his bag. I can only guess someone assumed the two bags with the same straps went together. Otherwise who knows where J´s bag would have ended up. Next was the airport shuttle taking us from Terminal A to Terminal C and then a mad dash off to our next gate. Got there just as boarding had started and with our Priority Boarding passes we got on right away. We were flying United and our dinner meal was defined as a snack: sandwich, salad, brownie. It was OK. Arrived only a bit late and, with no checked luggage, we were through immigration and customs pretty fast. Used an ATM to get some colones (Costa Rican currency) and then out to meet our driver ... who had a packet for us that contained our itinerary and vouchers for our trip. According to this report from CNN , United Airlines is the worst U.S. airline based upon a wide variety of parameters, including lousy customer service. After just returning from Costa Rica on United, I tend to agree. For a snack we were served what I have to believe is the worst airline food we've ever received. Even worse though was their customer service with getting us from our very late arriving international flight to our domestic flight. There was none. NADA! Unlike our last experience with American Airlines. When our Lima flight was running late, expediting orange boarding passes were waiting for us when we exited the plane. That got us into the quick line at passport control. On the other side of passport control another AA rep was waiting to get us quickly through security. And on the other side of security was a motor cart to take us to our gate. We started using United because AA has a minimal number of flights out of our airport and we typically have to go west before we can go east. Now AA has merged with USAirways which probably has the most flights out of our airport. I think we'll use up our United miles and then head back to American. P.S. And then there is today's fiasco with American's computers. I'm really beginning to believe there is no winning when flying ... other than being grateful when you finally get to your final destination safe and sound.